Attorney Greg Enos, has 33+ years of legal experience and is Board Certified in Family Law by the Texas Board of Legal Specialization. Enos handles divorce and child custody cases in Harris County (Houston), Galveston, and Brazoria County, Texas. Greg Enos has been through his own divorce and child custody battle (he won) and understands what his clients are going through. Enos graduated from the University of Texas Law School and was a very successful personal injury attorney in Texas City before he decided his true calling was to help families in divorce and child custody cases. Greg Enos is former President of Interfaith Caring Ministries. Enos is very involved in local politics and charities and he is a former Bay Area Bar Association President. Enos speaks at legal seminars on family law educating attorneys and judges and he publishes legal directories and a legal newspaper that are widely used and read by Houston area attorneys and courts. Enos is a respected leader of the legal profession working to improve family courts. Attorney Greg Enos has handled divorce and child custody cases big and small, including high profile cases such as a battle over custody over frozen embryos left over from fertility treatments. 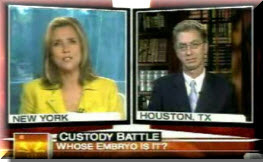 Enos has appeared on national news shows such as Today and Good Morning America. We represent clients throughout the greater Houston Galveston area, including: Houston, Clear Lake, NASA, Webster, Friendswood, Seabrook, League City, Galveston, Texas City, Dickinson, La Porte, La Marque, Clear Lake Shores, Bacliff, Kemah, Pasadena, Baytown, Deer Park, Pearland, Alvin, Angleton, Harris County, Brazoria County and Galveston County, Texas. Click Here for a MapMajor credit cards accepted.